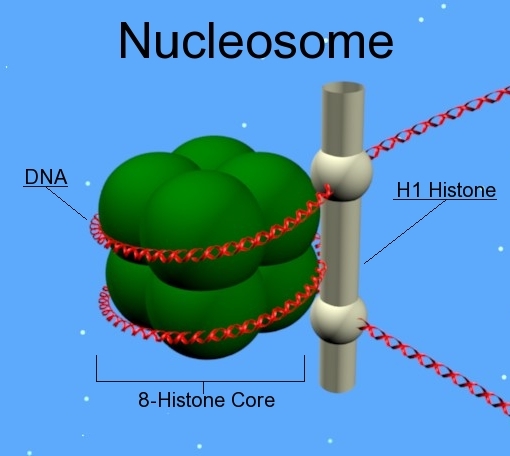 To form chromatin, the nucleosomes are bound together by another histone proteins called H1. 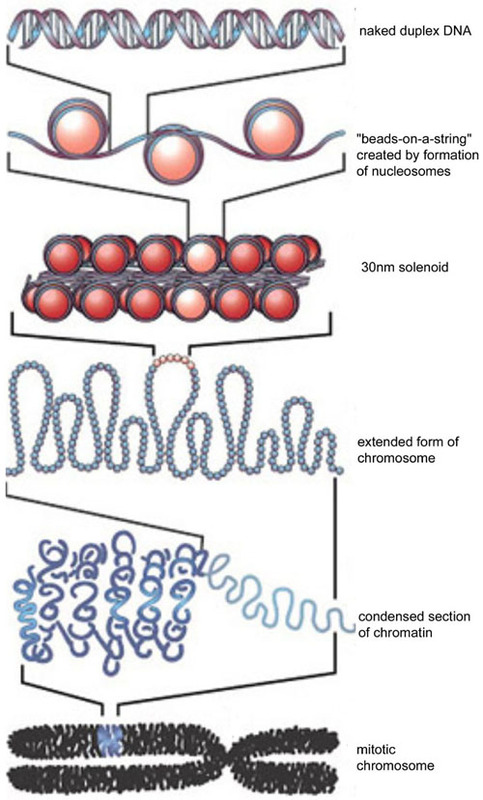 H1 winds the nucleosomes together into a chromatin fiber that is about 30 nanometers in diameter. These chromatin fibers are looped into a 300 nanometer coiled chromatin fiber, and these coiled chromatin fibers are then wound into 700 nanometer condensed chromatin. A chromosome that has been observed during the height of cell division (a phase called metaphase for those who are interested) has a diameter of 1400 nanometers, and since there are two chromatids present during cell division that compose each chromosome, these measurements agree completely with other work. All of this might seem rather dry and uninteresting, except that researchers at the Georgia Institute of Technology and Emory University have demonstrated that chromatin compaction is essential for embryonic stem cell differentiation. Embryonic stem cells (ESCs) express several different types of H1 subtypes, and ESCs that fail to express these H1 subtypes show reduced chromatin compaction and impaired differentiation. The diminished differentiation capacity of these genes seems to derived from the inability of these cells to properly silence particular genes. In this study, which was led by Fan and Todd McDevitt, who is an associate professor in the Wallace H. Coulter Department of Biomedical Engineering at Georgia Tech and Emory University, a ESC strain was used that lack three H1 subtypes; H1c, H1d, and H1e. These three H1 subtypes show increased expression levels during ESC differentiation, and the ESC strains triply deficient for these three H1 subtypes were unable to differentiate, even under standard culture conditions that normally induce differentiation. They also failed to differentiate in embryoid bodies, and could not form neural cells. When the triply-deficient ESCs were subjected to differentiation protocols, they remained tightly packed together, much like the early embryo. The cells also expressed genes that are found in the inner cell mass of the early embryo, such as Oct4. In order for the cells of the early embryo to properly differentiate, genes like Oct4 must undergo programmed down-regulation. In order to make embryoid bodies, this study utilized a rotary suspension technique that was developed by McDevitt and his co-workers. Normally, scientists use the so-called “hanging drop” method in which cells are placed in a drop of medium with few growth factors (20% serum usually), and suspended upside down on a microscope slide in a sealed chamber that prevents desiccation. under these conditions, the ESCs will form roundish little balls of cells that differentiate on the inside. These are known as embryoid bodies, and McDevitt’s technique forms three-dimensional embryoid bodies at very high-efficiency. Embryoid bodies contain cell types of all three primary embryonic germ layers (endoderm, mesoderm and ectoderm). However, when the triply-deficient ESC line was subjected the McDevit’s embryoid body-making protocol, that lacked differentiated cell types and largely resisted differentiation. This work also examined the ability of the triply-deficient ESC strain to differentiate into neural cells. However, the H1 triple-knockout ESCs could form neither neuronal nor glial cells, and unable to contribute to the formation of a neural network. Only 10% of the H1 triple-knockout embryoid bodies formed neurites and they produced on average eight neurites each in comparison to normal embryoid bodies, which produced, on average, 18 neurites. 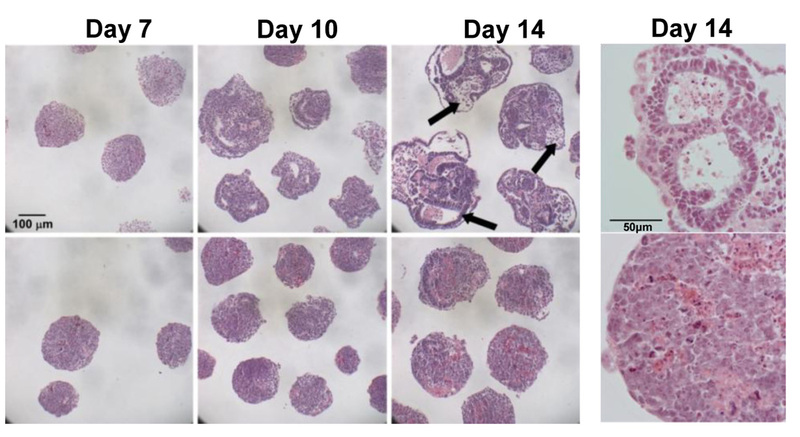 In he future, Fan and McDevitt would like to investigate if controlling H1 histone levels can be used to influence the reprogramming of adult cells to form induced pluripotent stem cells, which have the capacity to differentiate into tissues in a way similar to embryonic stem cells.